RAVENOL Performance Truck SAE 10W-40 is semi-synthetic multi-grade diesel engine oil for highly loaded diesel engines based on MC-systems. 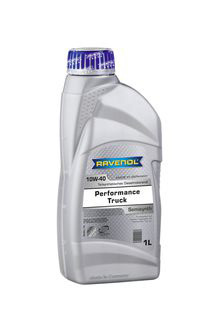 RAVENOL Performance Truck SAE 10W-40 is low-friction long-life engine oil for all kind of diesel engines with and without turbocharging in trucks, buses and machinery. Suitable for the longest oil change intervals. RAVENOL Performance Truck SAE 10W-40 has a higher performance than conventional high-performance engine oils. International such oils are called UHPD oils (UHPD = Ultra High Performance Diesel Oil). Regardless of the particular mileage, older diesel engines on RAVENOL Performance Truck SAE 10W-40 should be changed without rinsing. High wear protection even under constant load at full throttle. Reduced fuel consumption by low-friction characteristics. Quick oil circulation reduces cold-start and warm-up wear. Protection against bore polishing of cylinder paths. Protects against corrosion, even when using diesel fuels with high sulfur content. Safe protection against deposits and sticking, both under extreme thermal loads and short haul. Optimum compatibility with seal materials. Environmentally friendly due longest oil change intervals and low evaporation losses. Guaranteed extended drain intervals for the long-haul truck or transport.